October 5, 2009, the day that Gourmet Magazine announced that it was throwing in the towel, our hearts all skipped a beat. Was it really possible, or, like Mia Farrow in Rosemary’s Baby, were we all in a feverish nightmare trying to wake up to the smells of something good coming from the kitchen? No, it wasn't a dream; it was really happening. We had just renewed our subscription (for two years . . . we loved it that much) just the day before. What would we do now? Cousin Barbara e-mailed us the press announcement as reported by the New York Times. She suggested that we should come together to celebrate the life of this golden magazine by cooking our favorite recipes culled from shelves of dog-eared magazines, compilation books, and stained recipes printed from Epicurious. A gustatory feast? What an inspired way to eulogize the years of culinary inspiration, for not only did Gourmet provide each and every one of us with recipes to provoke, comfort, and challenge, it also gave us glimpses into the world of top-notch chefs, food writers, growers, butchers, and manufacturers. Every time we opened the mailbox and saw the latest issue awaiting us, our hearts aflutter, our eyes glued to the cover dish, we’d wonder what photo or seasonal veggie would inspire us to make our shopping list and walk to the local market in preparation for our next Gourmet meal. 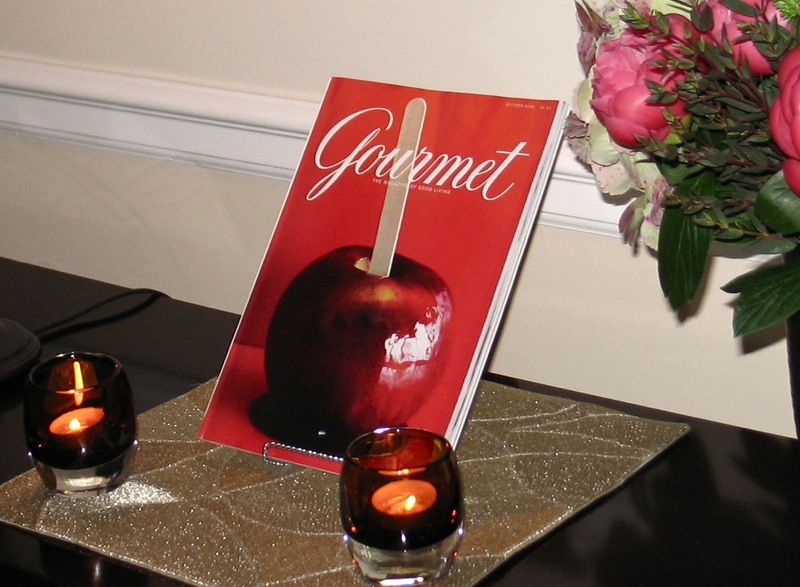 Every Gourmet reader had their favorite month. Traditionalists loved November, filled with Thanksgiving side recipes and new ways to make the turkey tender and savory. For some, fall’s orchard recipes would inspire pastry chefs of all ages to break out the rolling pin and start dusting the counter with flour. For others, many would count the days before the first spring issue arrived, excited for new recipes with peas, asparagus, and artichokes, almost forgetting what these harbingers of spring tasted like after a surfeit of winter root veggies. We decided to wait until spring to break bread. The season of renewal would inspire us, even if some of used fall recipes. Just so long as we made some of our favorites. It didn’t matter that none of us made a meat dish, or that there were two pasta dishes. This was about love and loyalty and getting together with friends to share an evening hanging out in the kitchen, and moving into the dining room when it was time. For a challenge, we’d also have to pair our dish with a beverage, either alcoholic or non-. To read more about this adventure of 4 foodies and the amazing dishes they made, plus two delicious and refreshing drink recipes, click here. 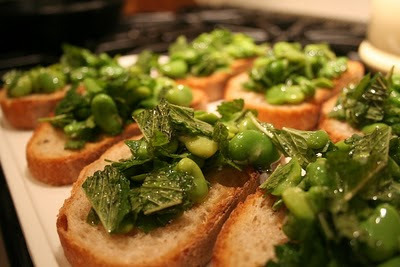 Fava Bean and Pecorino Bruschette, plus recipes for Oysters Rockefeller, the Tom Collins, The Mocktail, and links to recipes for the very best Macaroni and Cheese; Almond-Crusted Shrimp Cakes with Lemon Soy Mayonnaise; and Mushroom, Radicchio, and Smoked Mozzarella Lasagne. Click here. The Kitty Hawk Cocktail is the spawn of the classic Aviation. Spring has arrived and although it can still be a bit chilly, we’re getting a glimpse of what’s to come—clear blue skies, mild days, and, of course, refreshing cocktails. 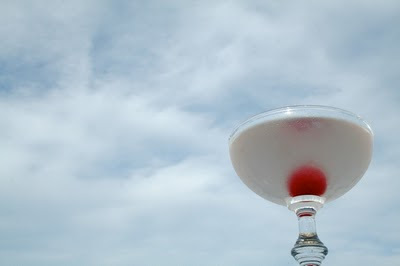 On that note, let us extol the virtues of the Aviation Cocktail. But first, a little history. It first appeared in print in Hugo Ensslin’s 1916 Recipes for Mixed Drinks containing four ingredients: gin, lemon juice, maraschino liqueur, and crème de violette. It is this last ingredient that lends the drink a pale pale pale sky-blue hue, ergo the moniker “Aviation.” Over the years however, especially in The Savoy Cocktail Book of 1930, we see that crème de violette is left out of the drink since it was difficult for many bartenders to find. On a side note, we’ve talked about crème de violette on “Buzzings” recently—it’s redolence is unmistakably floral. It’s not called crème de violette for nothing. Just a little bit can change the entire flavor profile of a drink. We use a fairly good amount of it in a Marianne at Midnight, an after-dinner drink in which the violet stands up to the strong peaty taste of scotch and the dark caramel notes in the Italian liqueur Tuaca. 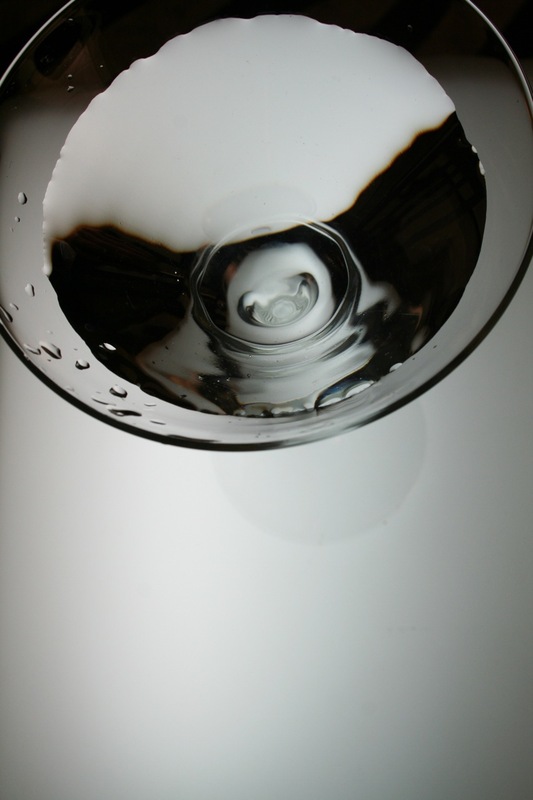 But since gin is more delicate than scotch, and its nose and flavor are already botanical, only a small amount is called for in an Aviation. So, getting back to our history lesson, during those lean decades, when the reality of reading a recipe that called for crème de violette was just a tease, we had to settle for Aviations without it. No pale blue color, no slightly floral whiff. Just the delicious melding of sour lemon juice, bittersweet maraschino cherry liqueur, and junipery gin. Fill a cocktail shaker two-thirds full with ice and add all the liquid ingredients. Shake for 15 seconds and strain (or double strain for a smoother drink) into a chilled coupe or cocktail glass. Garnish with a maraschino cherry. * If you cannot find crème de violette, you can, alas, omit it. For a slight variation, we add Catdaddy Carolina Moonshine to the gin and rechristen it the Kitty Hawk, in honor of, what else, the Wright Brothers, and because Piedmont Distillers, the makers of Catdaddy, are North Carolinian as well. The Catdaddy, with hints of cake frosting, or perhaps flan, adds a sweetness that is only hinted at in an Aviation. We’ve swapped out a maraschino cherry for one that’s boozy—a brandied cherry. For extra credit, try making some cocktail cherries with Catdaddy and spices that will complement the uniqueness of this flavored Carolina Moonshine, such as vanilla, cinnamon, and nutmeg. Fill a cocktail shaker two-thirds full with ice and add all the liquid ingredients. Shake for 15 seconds and strain (or double strain for a smoother drink) into a chilled coupe or cocktail glass. Garnish with a brandied cherry. Either way you like your sweet and sours, both of these drinks pair well with a variety of party food, from oysters to mini fish sandwiches to salty chips with dip. The world is your cornucopia. Have some fun and experiment before the spring is over with a cocktail party that takes flight with Aviations and Kitty Hawks. The Dammit Cocktail touts itself as the most intriguing, cutting-edge, eye-opening, exquisite, trailblazing, and downright delicious cocktail in the world. It has survived centuries of eager bartenders and home enthusiasts vying to create the perfect blend of spirits and mixers. But what exactly is in the Dammit Cocktail? Have you ever stumbled upon a description of a cocktail that sounded so tantalizing, you just had to make it immediately? You quickly eyeball the recipe, read down the list . . . so far so good . . . you have these ingredients at the ready. Then you look upon your bar, find the right bottles, but only a drop is left in one of them. It is in this very moment that the cocktail acquires its name as you utter, “Dammit.” You can improvise and substitute a similar spirit, but deep in your heart, you know you will be missing out on something special. Similarly, and worse because you cannot make substitutions, is a Dammit Cocktail that consists of a nonalcoholic ingredient you thought you had in your fridge, but cannot find despite rummaging through it three times. This cocktail is called the “Dagnabbit Cocktail.” For those of you hellbent on making the drink exactly according to the recipe, take comfort in knowing that you can always jump in your car or run to the corner store for that Holy Grail of missing ingredients. But never despair, dear reader, for we have a simple solution for you. Experiment and turn your Dammit Cocktail into something new. It may become the most intriguing, cutting-edge, eye-opening, exquisite, trailblazing, and downright delicious cocktail in the world.